Hilton has been operating as a Humanist Chaplain for some time and really likes being able to help people using evidence-based processes. HiltonT has been in the IT industry for quite a while now and was selected by Microsoft as their SBSC PAL in 2008-9, representing Australian SMB IT providers to Microsoft. This Blog is his outlet for his thoughts and feelings about life in general (including the IT industry). Some is good, some is bad, but all in all, its his viewpoint. Enjoy! 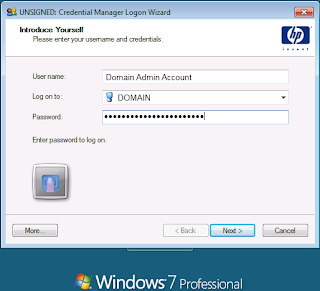 On HP desktop and workstation computers that don't use biometric logins, I normally uninstall all of the HP ProtectTools stuff. Well, I used to up to and including Vista and for some reason stupidly thought that maybe in Windows 7, HP had got their software working properly. Apparently, this assumption was incorrect. The main issue that I've seen in the past is that the HP ProtectTools suite seems to bork occasionally which then results in the error message I named this blog entry after: "The system could not access your credential management server..." and also occasionally the following error message: "The server is not responding properly. 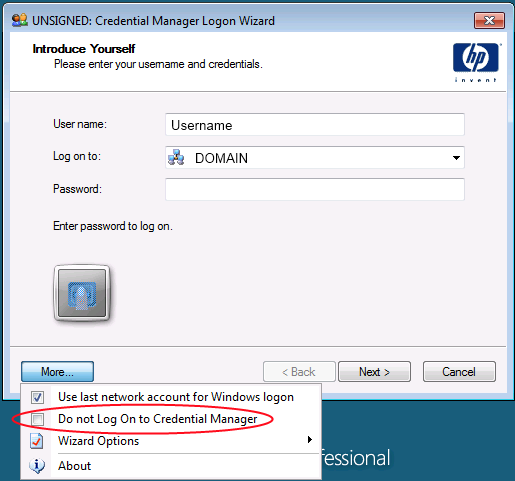 Verify that the Credential Manager server is properly installed on the target server." There's then no way you can log in to this system - either locally or onto the domain Fun, fun! Well, the fix (temporarily) is to disable the HP Credential Manager during login and long term is to uninstall the HP ProtectTools suite to leave the system able to work properly and reliably. 4. 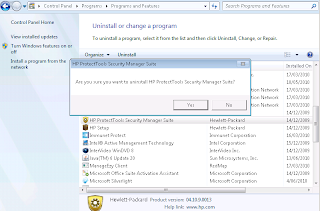 In "Control Panel\Programs\Uninstall a program", click on "HP Protect Tools Security Manager Suite" and click Uninstall. 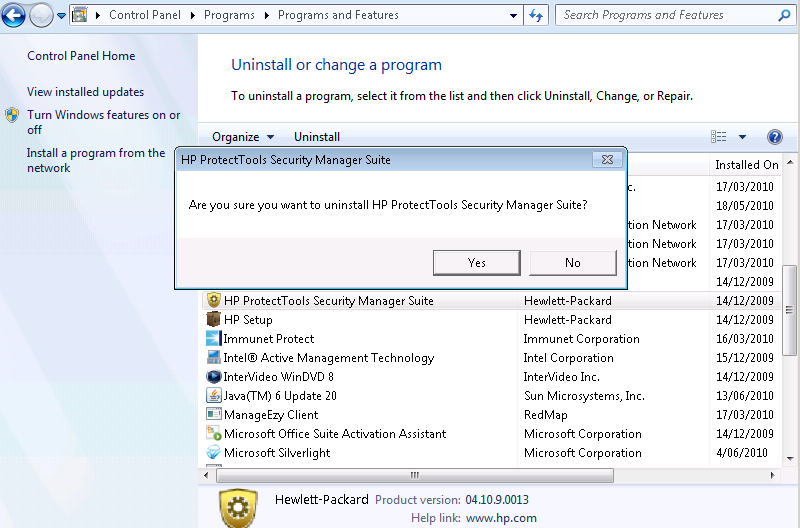 If prompted to uninstall various other Suite components first, please do so. Reboot and you'll be able to log in normally again! I tried some many things to get it working again, looked at so many website's but didn't find a solution. The solution you posted here, did the job! Now we can login normal, I'd like to thanks you very much for the solution! 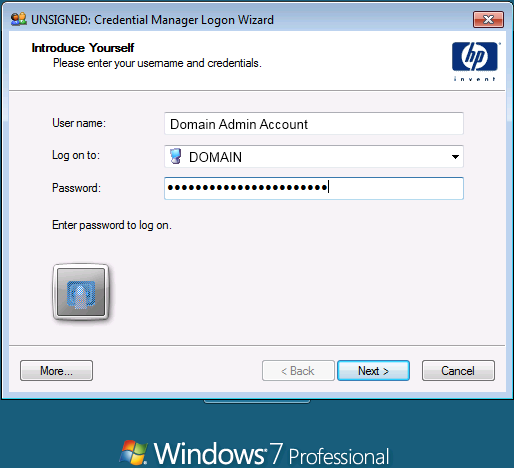 I have used Credentials manager for quite some time now. 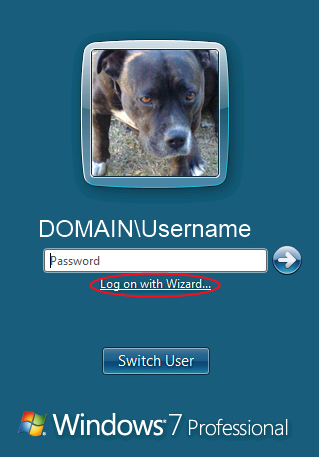 The problem only started to occure after a recent password change. My fingerprint scanner works to log me in, but sometimes I want to log in with my keyboard. I need a fix, not a workaround. You are an absolute star!!!!!! I was working in to the late and early morning hours when I came across your solution. This saved my but and gave me a chance to get some sleep. Hilton has been operating as a Humanist Chaplain for some time and really likes being able to help people using evidence-based processes. Hilton, from Quark IT, was selected by Microsoft Australia to be the Small Business Specialist Partner Area Lead (SBSC PAL) representing the Australian Small Business Specialists to Microsoft US for the 2008-09 year. Post this appointment, Hilton continues to work towards developing the local, national and global SMB IT Professional community and ensuring knowledge is made available to those who seek it. Hilton was a founding Board member of SMBiT Professionals and was voted in the Top 150 SMB IT Professionals in both the 2012 and 2013 SMB150 Awards.